"Herbert Janssen - with his plangent, fine-grained voice, keen intelligence, aristocratic musicianship, and (not incidentally) handsome appearance - was the leading German baritone in several major theatres during the 1920s and 1930s. After study with Oskar Daniel in Berlin he was immediately accepted by Max von Schillings for the Berlin State Opera, where he made his debut in 1922 as Herod in Schreker's DER SCHATZGRABER . He remained at the Berlin State Opera until 1937 singing both lyric and dramatic roles, many of them in the Italian repertory. He later appeared in important productions of DER FLIEGENDE HOLLANDER and TRISTAN UND ISOLDE at Covent Garden conducted by Reiner and Beecham, also singing Orest / ELEKTRA and in 1935 taking the title role in Borodin's PRINCE IGOR, for which he was highly praised. Janssen was a fixture at the Bayreuth Festival from 1930 to 1937. His Wolfram in TANNHAUSER set a standard not approached since, and, fortunately, it was recorded in a somewhat truncated 1930 production. During that decade, he established benchmarks for several Wagner roles, particularly Kurwenal, Telramund, Gunther, and - especially - Amfortas. His interpretation of the latter was an exquisitely sung realization of a soul in torment, achieving a remarkable unity of voice, movement, and makeup. 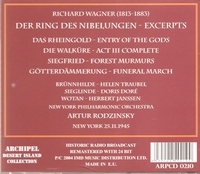 His doggedly loyal Kurwenal is preserved on complete recordings of TRISTAN UND ISOLDE made live at Covent Garden in 1936 and 1937. His tortured Dutchman is also available in a live recording made at Covent Garden and featuring Kirsten Flagstad as Senta. In addition to his stage work, Janssen acquired a reputation as a superior singer of Lieder. The exceptional beauty of his voice and his interpretive acuity made him a prime candidate for Walter Legge's Hugo Wolf Society venture of the 1930s. Among the finest singers Legge could pull together, Janssen was given the largest assignment and his subscription recordings made throughout the decade remain supreme, even in the face of the best achievements of post-war Lieder singers. Janssen was very unpopular with the Nazi regime, having turned down a dinner invitation from Hitler at Bayreuth, Janssen left Germany in 1937 and with Toscanini's assistance traveled immediately to Buenos Aires. After a season in Argentina, he came to the United States where he made his debut at the Metropolitan Opera in 1939, remaining at that theater until his stage retirement in 1952. From 1940 onwards Janssen sang regularly at Buenos Aires and with the San Francisco Opera between 1945 and 1951. Following his retirement in 1952, he remained in New York as a respected teacher. Janssen's performances were notable for the warm and sympathetic timbre of his voice, his excellent command of legato and clear enunciation, as well as his convincing acting. Also a highly accomplished lieder singer, he had in addition starred in the musical DREI MUSKETIERE at the Metropol Theatre in Berlin during 1928 opposite Gota Ljungberg."